A top complaint of college professors is that students’ writing skills often lack the level of sophistication that common college vocabulary requires. Improving writing skills is only one advantage of having an expansive college vocabulary. Studies show that a strong vocabulary is linked to better comprehension of the college curriculum as well as educational — and career — success. 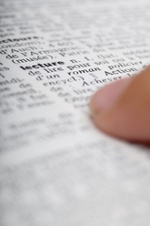 Having a robust college vocabulary has been shown to be important to future success. The PSAT test, the SAT test and the ACT test are formatted to assess the knowledge, skills and understanding of your student. Although the ACT essay is optional (and the SAT essay will be optional in the next release), college entrance exams still include college vocabulary embedded into test questions and critical reading passages. PSAT/SAT Test: The PSAT, also known as the National Merit Scholarship Qualifying Test (NMSQT) and its sister test, the SAT college entrance exam, currently test vocabulary directly through the critical reading subtest. In the future, the PSAT and SAT will test vocabulary in context of a reading or science passage. ACT Test: This college entrance exam features college vocabulary in context of English, reading, and science passages. Your student needs to understand advanced vocabulary in order to make sense of the passages and questions. The important thing to keep in mind is that college entrance exams will continue to place emphasis on reading comprehension and reasoning within a specific context. Go beyond textbooks and challenge your child to read books for enjoyment. Reading literature inherently provides context to words. Also, pick a few articles from publications and have your child choose three or four words he or she is unfamiliar with, then look up the definition for each word and look up the word in a thesaurus. Increased exposure to a word is a proven method for helping students learn college vocabulary. Use a fun online tool to build college vocabulary through challenging test questions in context. Or, help your child create flashcards that have a college vocabulary word on the front of each card, and the definition along with other helpful information on the back. When your child finds a word he doesn’t know while reading, have him try to determine the meaning of the word from the context in which it’s being used. Afterwards, look up the word in a dictionary together, to confirm the exact meaning. This type of college vocabulary practice is highly applicable to college test prep as a whole. Pick a college vocabulary “word of the day,” and use that word in conversations at the dinner table or whenever you are chatting with your child. Actively using college vocabulary words helps you child truly adopt the word instead of just remembering it for the short term during test prep. Everyone can benefit from beefing up vocabulary skills, so why not make it fun for the whole family? Carve out time to play word games like Scrabble or crossword puzzles. Studying high-utility vocabulary words is extremely important to doing well on college entrance exams. However, true comprehension of college vocabulary words goes beyond higher education. Outside the hallowed halls of higher learning, a strong vocabulary has been proven to have a direct correlation to earning power in the workforce. People who possess a true command of words typically hold advanced positions within most companies.